The Motorola Droid X is the latest Google Android OS 2.1 smartphone on a 1 GHz processor offered by Verizon Wireless. It features a large, bright, sharp and crystal clear 4.3-inch display with a resolution at 854x480, which offers fabulous playback quality, especially when watching video. The 8 GB of internal memory with microSD slot up to 32GB capacity expansion (16 GB preloaded microSD memory card, or optional 32 GB microSD card) delivers Motorola Droid X the ability to store more media files, like text, photos, or videos. All that and more make Motorola Droid X a fantastic device to experience videos and movies on the go. Haven’t found out an available way to transfer videos, standard DVDs and Blu-ray movies for playback on Motorola Droid X? 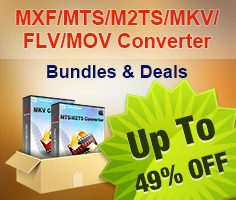 No worry, this article will direct you on it in detailed steps with Pavtube Blu-Ray Video Converter Ultimate. Tutorial in detail: How to transfer videos, standard DVDs and Blu-ray movies for playback on Motorola Droid X? Step 1: Download Pavtube Blu-Ray Video Converter Ultimate, install and run it. Launch Pavtube Blu-Ray Video Converter Ultimate to transfer videos to Motorola Droid X, or convert DVD and Blu-rays to Motorola Droid X. The program is an all-in-one solution to fast convert blu-ray discs, DVDs, videos to Motorola Droid X. Once run it, click “Add Video” to load your video files like MTS/M2TS, MKV, MOV, TOD, TiVo, etc. and click “Load BD/DVD” to load your DVD and Blu-ray movie files. 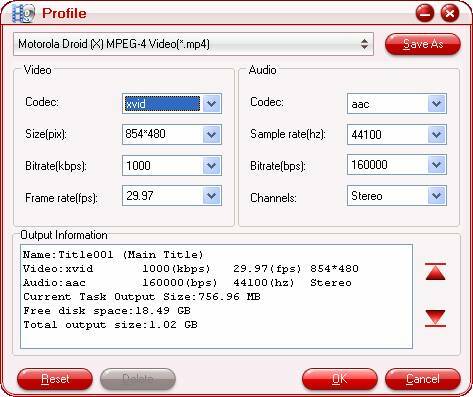 To convert blu-ray discs, DVDs, videos to Motorola Droid X by using Pavtube Blu-Ray Video Converter Ultimate, you need select an output format specialized for the gadget from the numerous output formats. Click on the pull down menu of “Format”, and follow “Android”> “Motorola Droid (X) MPEG-4 Video (*.mp4)”. 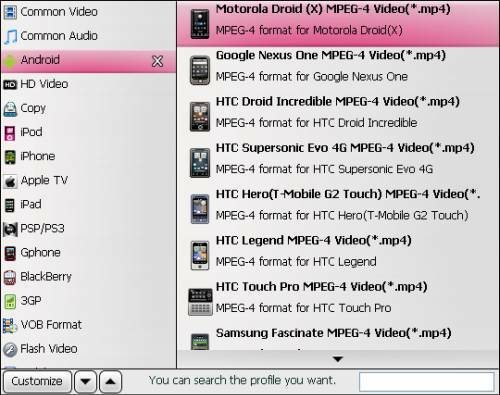 As you see, the application offers a wide variety of formats developed for smartphones running Android OS, like Nexus One, HTC Evo 4G, and more, to transfer videos to Motorola Droid X, or convert DVD and Blu-rays to Motorola Droid X, “Motorola Droid (X) MPEG-4 Video (*.mp4)” is your suitable choice. The Blu-Ray Video Converter Ultimate enables users to adjust audio and video parameters when transfer videos, standard DVDs and Blu-ray movies for playback on Motorola Droid X. The adjustable settings include codec, aspect ratio, bit rate, frame rate, sample rate and audio channel. You can do your changes to make your own settings. If you are not good at this step, just skip it by using the default settings. Click the big button “Convert” to transfer videos to Motorola Droid X, or convert DVD and Blu-rays to Motorola Droid X. With multi-thread encoding technology and optimized audio and video in sync technology, Pavtube Blu-Ray Video Converter Ultimate is able to finish conversion at super high speed, and will never let you encounter troubles caused by audio and video out of sync issues. In addition, it adopts unique built-in codec, which can absolutely ensure not to install any codec on your computers to disturb the original systems. Once the conversion task is finished, you can click “Open” button to get the final output files for your Motorola Droid X. Hope this helps. For Mac users, please check: How to convert videos, DVDs and Blu-rays to Motorola Droid X and Motorola Droid on Mac?